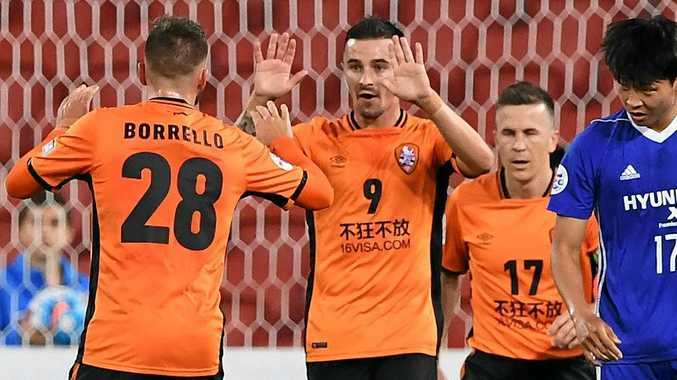 JAMIE Maclaren farewelled Brisbane with a double on Wednesday night but it wasn't enough as the Roar ended their AFC Champions League campaign with a 3-2 loss to South Korean visitors Ulsan Hyundai. In front of just 3245 fans at Suncorp Stadium, it was the Roar's fourth defeat of their Group E campaign, condemning them to last spot. Both of Maclaren's goals were set up by another of Brisbane's departing stars, Brandon Borrello. While it was the last time the pair will be seen together in Brisbane colours, the duo may yet combine next season, with speculation mounting that Maclaren will join Borrello at German second division club Kaiserslautern. Maclaren finished his Roar career with 43 goals from 61 appearances in all competitions. He could have had more last night, having spurned two glorious second-half chances from close range as the Roar created plenty of opportunities despite the absence of creative spark Thomas Broich, who is also headed for Brisbane's exit door. The missed chances were to prove costly as Ulsan also profited from some shoddy Roar defensive work to secure third place in Group E.
Brisbane goalkeeper Jamie Young gifted the visitors the lead in the ninth minute, when fumbled a weak Seo Myeong-Won shot. The ball slipped through his hands before rolling through his legs and into the net. Maclaren equalised nine minutes later when he pounced on a defected Borrello cross. The same pair combined again in the 37th minute to give Brisbane the lead. Borrello again fed Maclaren, who beat Ulsan's flimsy offside trap to score his 23rd goal in all competitions this season. Maclaren should have had his hat-trick in the 53rd minute but hit the post from the edge of the six-yard box. Ulsan equalised a minute later through Nam Hee-cheol, who pounced on a horrific back pass from Brisbane's makeshift left fullback Tommy Oar. The visitors netted the winner in the 75th minute via Kim Yong-jin, who was first to a well-placed free-kick from fellow substitute Lee Yeong-jae.